This stout was created in collaboration with our friends from Philadelphia’s Standard Tap and Johnny Brenda’s restaurants. Using their delicious hand-roasted JB’s Coffee, our bourbon barrels deliver a bold and robust, chocolate malt-tinged stout. 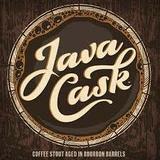 We invite you to toast the Victory of friendship and beer with Java Cask!